Summertime fun kicked into high gear at Harker, this year, as enrollment for camps and other seasonal programming skyrocketed across all three campuses, resulting in a record-breaking number of participants. Shortly after school let out, Harker opened its doors to the public, becoming a one-stop-summer-program-shop by extending its huge variety of offerings to K-12 students both locally and from around the globe. According to Harker’s summer programs office, attendance at all summer happenings totaled some 2,740 participants. On the Harker summer menu were a camp for young kids, an institute for middle and high school-aged students, a program for foreigners to learn English, a large and varied sports camp, and a swim school that even adults could attend. “We were thrilled and delighted at the incredible turnout for Harker summer this year!” enthused Kelly Espinosa, longtime director of summer programs. She noted that Harker has been providing outstanding summer programming for more than half a century. In addition to the larger number in overall enrollment, there were exciting new happenings in both the English Language Institute (ELI) and Summer Institute (SI) programs. At the lower school ELI saw a huge jump in enrollment specific to elementary school students. Meanwhile, at the upper school, SI successfully added specialty classes to its afternoon activity program. “Harker summer had everything a camp consumer could want,” said Espinosa, adding that she was also pleased to see how many non-Harker students chose to spend their summer at the school. 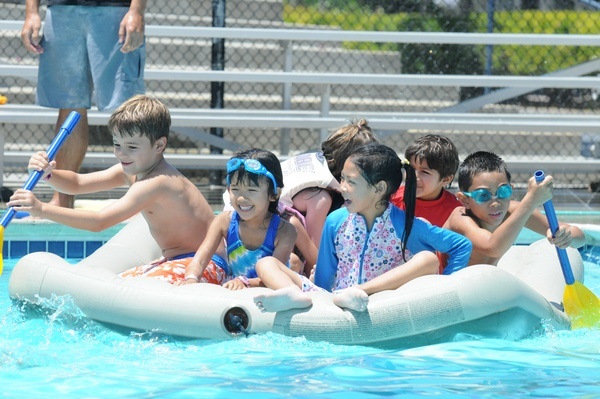 It truly was “the summer of wow!” over at the lower school’s Summer Camp+ program, where 763 children in K-6 enjoyed a wide array of summertime activities designed to delight and amaze them. According to Joe Chung, program director of Camp+, Harker’s youngest students were happily occupied with such on site highlights as a patriotic games bash, water carnival, sleepover for older campers, presentation for parents, and birthday celebration for camp mascot “Ray.” Campers also partook in numerous offsite field trips, from local outings for bowling and miniature golf to farther trips out to the Oakland Zoo and Coyote Point. Students had the choice of enrolling in either CoreFocus or LOL (Learning Opportunities in Literature) for the academic portion of the day. Core Focus was a three- or four-week math and language-arts-focused program. LOL was a two-week integrated curriculum centered around a literary theme. Both programs left room for the optional added afternoon activity program. Afternoon activities were grouped by ages and weeks, with kindergartners attending kindercamp. First and second graders were in the owls group, third and fourth graders were called condors, and fifth and sixth graders were referred to as eagles. The first session of camp included such weekly themes as wow, whamo, wipe out, and work out. The second session featured weeks called wisdom of wizards, waiting on winter and wonders of wildlife. From backyard games held on the upper school field to volleyball boot camp and a cooking corner in the gym and kitchen, Summer Institute (SI) students this year enjoyed brand new specialty class period offerings. Open to both Harker students and the general public in grades 6-12, the institute got underway mid-June and ran until early August. SI had two separate tracks, one designed for middle schoolers and another geared towards high school students. SI participants typically combined a morning academic program with afternoon activities, allowing them to earn credits and learn new skills with plenty of time leftover for summertime fun. The unique specialty classes were made available via SI’s afternoon activity program where many middle school students (and some high school freshmen) signed up for courses which changed weekly and included off-campus field trips. Rotating course options included art, cooking, outdoor games, volleyball, jewelry making, magic, improv, dance, tech, junior lifeguard, chess and circus arts. The institute’s academic portion offered rigorous for-credit courses such as algebra, economics and programming, as well as non-credit opportunities for enrichment and growth like creative writing, Web design, debate and robotics. A driver’s education course was available for students aged 15 and up. Grade 9 students had the option to either participate in Activity Program (AP) or join the older high school students who had no organized afternoon activity program but enjoyed free drop-in access to the library, pool, art room, Ping-Pong table, basketball courts and study spaces. For all grades, an on-site prepared lunch was included. According to Keith Hirota, summer middle school director, a total of 920 middle and upper school students were enrolled in this summer’s overall SI program, of which 550 participants were non-Harker students. Ten-year-old Richard Hsieh is non-Harker student who met his new Harker pal Nakul Bajaj, age 11, in SI. Although the two took different morning academic tracks, they said they enjoyed hanging out together for many of the afternoon activities – and now hope to continue their newfound friendship during the regular school year. Summer at Harker brought with it its own special international flavor, as students at both the lower and upper schools got to meet and interact with peers from all over the world. Thanks to the school’s renowned English Language Institute (ELI) program, more than 100 international students – from elementary through high school – come to Harker to increase their chances of admission to primarily English speaking educational institutions. According to Anthony Wood, ELI director, this year’s program saw a notable increase in enrollment at the beginner level, requiring a total of four classes, with at least 55 youngsters enrolled in the primary division. Older students (middle and high school aged) attended ELI on the Saratoga campus. At the lower school program, 9-year-old ELI student Helen Kozak recalled that going on a recent field trip to the beach at Santa Cruz reminded her of being back home in Ukraine, where she lives near the sea. “I like the ocean very much,” she said in remarkably good English, adding “I swim all day long.” In addition to swimming, her favorite things about ELI were archery, circus arts and computer lab. “I like it all,” said Kozak, who has been to the United States several times but never before in the ELI program. “My favorite thing about ELI was recess … which we are in right now!” added 11-year-old Aaron Guo of China. The first time ELI participant said that his second favorite activity was basketball. He also liked all the “fun outings” to places like the Golden Gate Bridge and tide pools at the ocean. At the Saratoga campus older ELI students worked on special projects tailored to their needs, including SAT preparation. They were assisted by mentors (called buddies or conversation partners) who are Harker juniors, seniors or recent graduates. At the end of their time at Harker, ELI students, upon full completion of either a three- or seven-week course, received a certificate and recommendation from their teachers. On field trip days ELI students of all ages could be seen sporting green Harker T-shirts as they headed out for cultural adventures to diverse Bay Area tourist attractions. Upon their return, their travel experiences were strategically incorporated into their learning curriculum. The middle and upper school campuses set the scene for Harker’s wide variety of on-site, first-rate sports camps, where 518 athletes learned a new sport or worked on improving skills in a sport they had already taken up. This year Harker offered softball, basketball, football, soccer, TRX (suspension body training), wrestling, volleyball and water polo camps. It was just last year that water polo was added to the sports camp choices. All of Harker’s summer sports camps are designed to be a positive, skill-focused environment where highly experienced coaches provide training in a well-structured, character driven atmosphere. Young athletes were encouraged to improve skills, develop teamwork and, most of all, have fun! The Harker Swim School provided both children and adults the opportunity to learn, refine and extend their swimming abilities in a noncompetitive, positive environment. Held at the upper school’s beautiful Singh Aquatic Center, it offered swim lessons for all skill levels, as well as a junior swim team for students in grades 2-8. The swim school is not part of Harker’s regular sports camp programming (for example, the water polo camp is not taught through the swim school). For more information on Harker’s varied summer offerings visit summer.harker.org.